The premium Ecotribe set of metal straws is the perfect solution for the environmentally conscious individual or family. 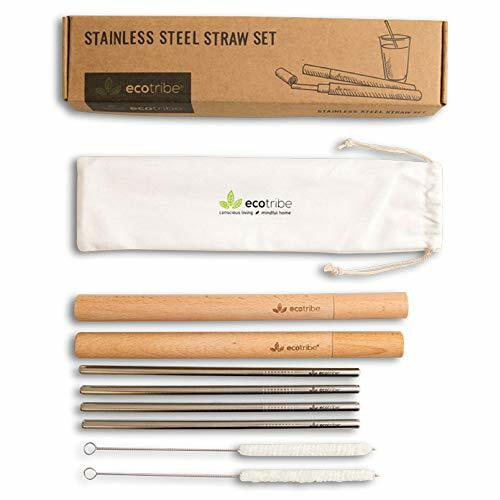 Constructed from 18/8 stainless steel, these metal sipping straws are an eco-friendly replacement for disposable straws and have an immediate impact on your plastic footprint. Our straight metal straws travel with you wherever you go, so you never have to worry about sending plastic straws to the landfill again. These reusable straws with case are easily packed up for portability: cleaning brush inside straw inside case. Our metal cocktail straws fit right in your pocket or can be tucked away in any size bag to ensure that you have one on hand each time you enjoy a beverage. Reusable stainless steel straws put your mind at ease since they are FDA approved for safety, as well as nontoxic and BPA free. They offer two convenient cleaning options since they are both dishwasher safe and come with metal straw cleaners. 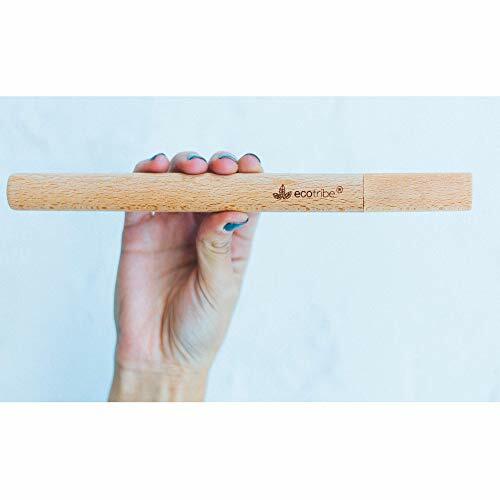 These long metal straws are also the perfect size for a whole range of drink containers and beverages, even the thickest smoothies and milkshakes. Enjoy the purest flavors of your favorite beverages through our quality metal straws. Our set includes: stainless steel straws with logo, beech wood carrying case with logo, cotton and stainless steel cleaning brush, and a calico drawstring bag. 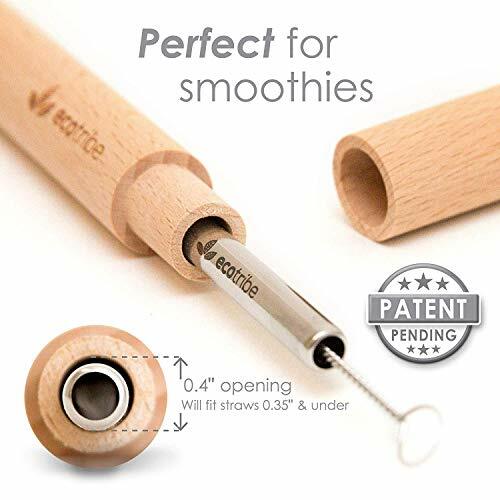 ECO-FRIENDLY STRAWS: This set of environmentally friendly reusable drinking straws is convenient, durable, and long lasting. Carry these metallic straws with you wherever you go to eliminate your use of throwaway straws that end up in our landfills. Our metal straw pack is a quick and easy way to reduce your carbon footprint with each and every drink, and take a stand against plastic pollution. A sleek and chic sustainability statement. TRAVEL FRIENDLY STRAWS: These reusable straws travel so well that you can always carry them with you on-the-go. Tuck the cleaning brush inside the straw and pop them both into the metal straw holder. The portable reusable straw case fits in your pocket, purse, backpack, or briefcase, so you can conveniently have a reusable metal straw on hand at home, the office, or whenever you are out enjoying a beverage. SAFER STRAWS FOR YOUR FAMILY: Unlike cheap plastic straws, our FDA approved metal straws are nontoxic and BPA free, making them safer for regular use. Made from 18/8 stainless steel, these wide reusable straws will not rust or scratch. They are dishwasher safe making it is easy to ensure they are clean and sterilized before each use. Or, you can use our cotton and stainless steel cleaning brushes to keep your straws clean on-the-go. 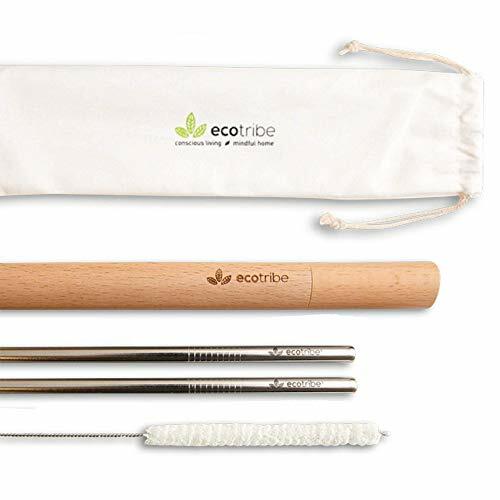 VERSATILE STRAWS: EcoTribe's wide and large metal straws are long and versatile enough for use with a variety of tumblers, glasses, mugs, and even mason jars. Whether you are looking for a perfect metal smoothie straw, metal milkshake straw, metal tea straw, or metal soda straw, this is just the solution for you! These reusable straws are also a great option for a range of other beverages from iced coffee to seltzer or mixed drinks. 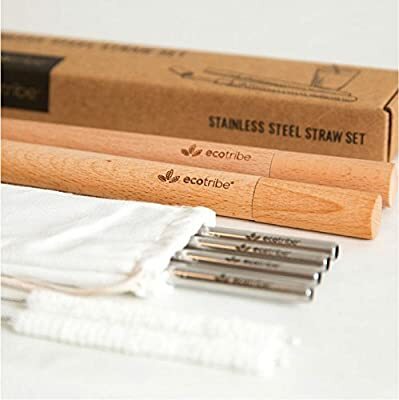 QUALITY CRAFTSMANSHIP: From our decorative metal straws, each stamped with the EcoTribe logo, to our reusable straw case, crafted from discrete beech wood with our logo etched on the side, this metal straw set exudes style. The pack even includes a drawstring calico bag for any eco reusable straws that are not in use. This quality extends to your sipping experience as these long, reusable straws deliver the pure flavors of any beverage without any aftertaste, and offer a chilling effect.